Dr.T's Sing-A-Long is the award-winning series that encourages kids to sing and enjoy music. 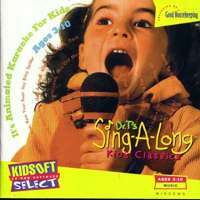 Arrangements are designed just for kids and are easy to learn and perform. Sing along as cartoon characters perform to classic children's tunes. "Doc" is your guide to the exciting and educational world of music, complete with scrolling sheet music and lyrics. Chosen "Music Education Product of the Year," Dr.T's Sing-A-Long features lively animations, CD music, scrolling lyrics, notes, and guitar chord grids. Prints full sheet music for all songs with lyrics and notes. Little Kids Mode lets young children choose any song by its picture. Turn vocals on or off or change notes to guitar chord grids. Each title comes with its own Songbook. Two different song collections are currently available. Kids' Classics includes 25 favorite children's songs: Baa Baa Black Sheep, Down By The Station, Frere Jacques, Hickory Dickory Dock, Humpty Dumpty, Itsy Bitsy Spider, I've Been Working On The Railroad, London Bridge Is Falling Down, Mary Had A Little Lamb, My Bonnie Lies Over The Ocean, Oh My Darling Clementine, Oh Susanna, Oh Where Has My Little Dog Gone, Old MacDonald, Polly Wolly Doodle, Pop Goes The Weasel, Red River Valley, Row Row Row Your Boat, She'll Be Comin' 'Round The Mountain, Skip To My Lou, Farmer In The Dell, This Old Man, Three Blind Mice, Twinkle Twinkle Little Star, Yankee Doodle.